TrueSwords will have a limited supply of these officially licensed swords available October 2014, pre-order yours now! This authentically detailed replica sword of Strider is a reproduction of the actual filming prop featured in The Lord of The Rings film trilogy. The collectible was crafted using only the finest grade materials and craftsmanship of the highest quality with exceptionally close attention to detail. It has a 36" blade of thick tempered stainless steel with antique-finished metal handle parts and genuine leather wrappings. 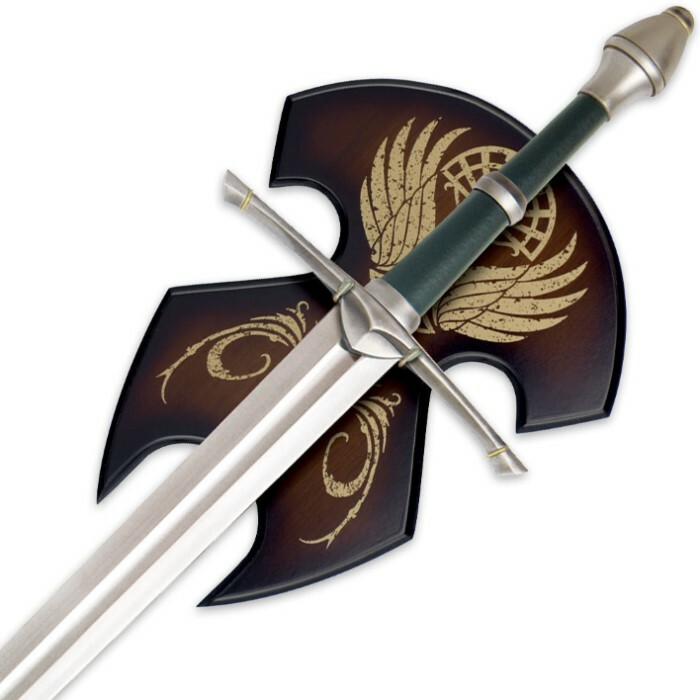 Strider's sword also includes an attractive display wall plaque adorned with the heraldic insignia of the Kingdom of Gondor. Like all officially licensed LORT collectibles, it also includes a certificate of authenticity. Measures 47-1/4" in overall length. Strider, also known as Aragorn, is the son of Arathorn and heir to the Kingdom of Gondor. His ancestor, Isildur, was the King who cut the Ring of Power from the hand of Sauron with the sword Narsil. 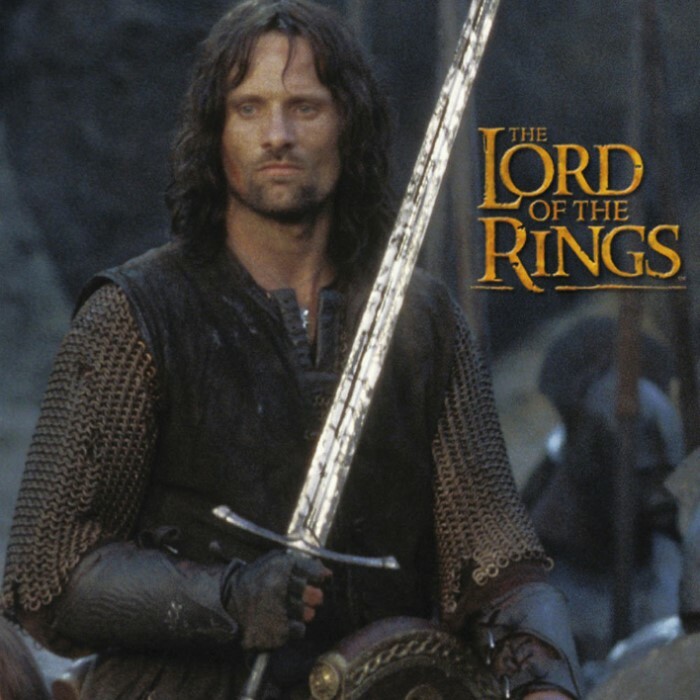 Strider has served as Ranger and joins the Fellowship to destroy the Ring that threatens his countrymen. 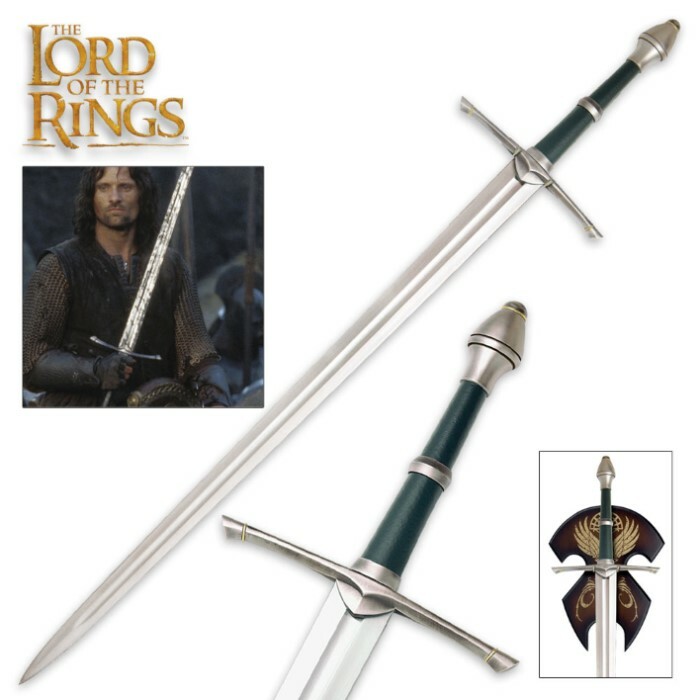 I own several United Cutlery LOTR swords, and while this one is not the most ornate, it is the most well-balanced (not that I would swing it at anyone, but it has a wonderful feel to it). Of course the quality is only the finest too! United Cutlery never disappoints and BUDK always delivers! This is a good quality sword as what you might expect from United Cutlery. This sword is a solid piece with no defects. I am glad I added this sword to my collection. I decided to get a new Strider Sword with this re-release, as my current one was bought 2nd hand and wanted a new, nice one for my new-in-box Scabbard. The first sword I received looked nice, but had a wobbly handle, no CoA, and had a run in it's finish on some fittings as though it hadn't cured long enough before getting packed up. Budk fixed me up and the exchange was simple enough. The second one I received was solid and had all it's bits as they should be. I was kind of surprised to see that the sword was still being made in Taiwan...or at least that's what it says on the blade. I thought they were all China made now. I was happy to see that the coloring for the leather, wrapping the handle, was spot on when compared to my other sword and scabbard. My biggest disappointment with this sword is that it doesn't fit correctly in it's scabbard now. I dunno if UC made a slight change to it's dimensions or what, but I can't get the sword all the way in the scabbard. My other Strider Sword fits perfectly, but the new sword doesn't fit in my new-in-box scabbard or another Strider Scabbard I have. I prefer to display my sword with it in the scabbard. Seeing the sword doesn't fit as it should really irks me, but if you plan to display the sword without being in the scabbard it should look just fine. The strider sword is excellent...own it for over a year now and couldn't be more pleased with it! I have the whole collection of lotr swords and this is of same high quality as the rest of them are.....united cutlery makes best replicas out there period ! Just got my sword, checked it out its very nice sword big in size. The feel in your hand is good. Ok this thing is legit. I just got it today and it is just straight up awesome! Very solid sword. Doesn't bend or wobble. The handle feels awesome and is good size. I am 6'6" and have large hands. I was able to fit both on the handle. Very well made!